Found 31 file extension associations related to IBM Notes (Lotus Notes) and 29 file formats developed specifically for use with IBM Notes (Lotus Notes). IBM Notes (also known as Lutus Notes) software brings together email, collaboration tools, and business applications within a rich, integrated desktop experience, helping you discover, transform, and share content across geographically disbursed teams. You can be productive both online and offline, and seamlessly leverage people and resources throughout the enterprise and across the Internet. Provides a robust and productive user experience with a single point of access to email, calendars, contacts, activities, instant messaging, feeds, office documents, collaboration tools and business applications. Helps users manage their ever-growing inboxes effectively, with full-text search, delegation, mail filtering and sorting, conversation views and flags. 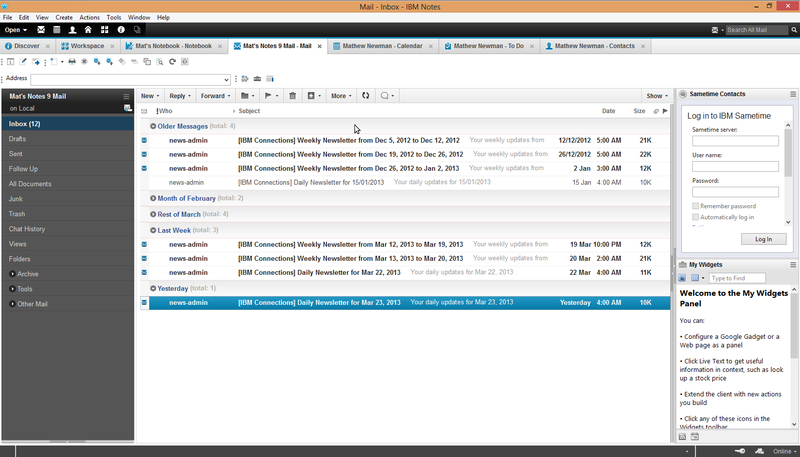 Helps increase user productivity with customizable widgets that can recognize specific patterns of text in Lotus Notes documents; recognized text can be clicked to perform the appropriate business action associated with that widget, such as retrieving information from a flight number in an e-mail. Helps users instantly locate and connect with resources via presence awareness, business cards and instant messaging incorporated in context within the inbox and calendar. Helps minimize or eliminate the impact of computer viruses through robust security features. Helps drive business value through composite application technology that allows you to integrate and present line-of-business solutions and data from multiple systems into a single view for end-users. Helps users to be productive even when disconnected from the network with advanced replication technology. If you need more information please contact the developers of IBM Notes (Lotus Notes) (IBM), or check out their product website.